Samsung is continuing to have a tough time competing with Xiaomi in the Indian market. Earlier this year, Canalys and Counterpoint both found Xiaomi to have beaten Samsung in terms of smartphone shipments in India in the fourth quarter of 2017. 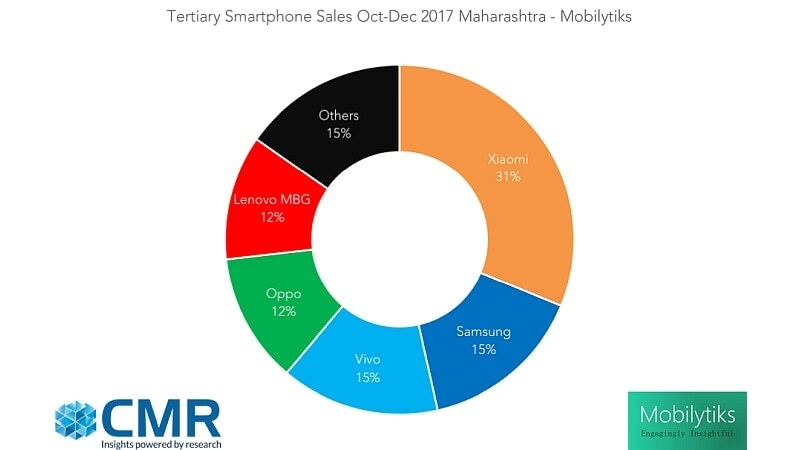 Now, CyberMedia Research (CMR) has published its Mobilytiks report for the same period, and found that Samsung lost to Xiaomi in the largest smartphone market in India – Maharashtra. The state accounted for 13.7 percent of all smartphone sales in the country, the CMR report said. The CMR Mobilytiks report found that Xiaomi sold 31.2 percent of all smartphones sold during Q4 2017 in Maharashtra, compared to Samsung’s 15.3 percent. Sales were led by Xiaomi’s popular Redmi Note 4 smartphone. CMR attributes some of this performance to the launch of Mi Home stores in the state. “Xiaomi opened two Mi Homes in the state during the months of October and November 2017. This strengthened its presence and access in the state. In January 2018, it opened its third Mi Home in the state in Thane,” the report read. As for other OEMs in the top 5, CMR says Vivo was third with a 15 percent share, Oppo fourth with a 12 percent share, and Lenovo (including Motorola) was fifth with a 12 percent share. Together, the top five accounted for 84 percent of all smartphones sold in the state during the period. The reports adds that the net subscriber addition during the quarter was negative, due to RCom and Aircel, and that smartphone sales in the period were primarily replacement or upgrade. The fastest losing smartphone brands during the period in the region were Micromax, Intex, Karbonn, Sony, and iBall. Collectively, the top 5 losers accounted for 66.5 percent of the smartphones that were discontinued by users in Maharashtra during Q4 2017. “This switch from Indian brands to Chinese and global Tier I brand like Samsung is primarily driven by users upgrading for 4G Smartphones where the Indian brands haven’t been able to establish a foothold,” the report read.